Reader John O pointed us to a very good post from the Economic Policy Institute which gives a thorough analysis of recent unemployment data and puts it in a broader historical context. Bottom line: it is not pretty. The fixation with looking for a turn in initial jobless claims as a sign of recovery seems to have diverted attention from how deep the unemployment hole is this time around. This entry was posted in Economic fundamentals, Free markets and their discontents on September 2, 2009 by Yves Smith. Last chart is particularly good (well informative, but bad news for us(. Not only is duration obviously rising for structural reasons (higher peaks each recession) but peaks occur longer after recession ends. This rising lag means unemployment should continue to get worse – with obvious knock on effects for loans, credit card defaults etc. As if this wasn’t enough bad news, have a look to this “wage deflation” phenomenon that may start to take hold. What accentuates this is that household debt as a percent of income went from about 45% in 1968 to 99% in 2008. I had just left the Air Force in 1979 – went to school, but a year and a half later looking for a job to rebuild my finances after some medical problems. I surprised at the 1980 figures, but than if you put it with the 1981, it makes sense. The fact that we are worse off than in 1980 makes it more real to me, because I remember what desperate straits I was in. Will we get out of this situation like we got out of 1980? If you look at the various metrics of debt, it seems to me that we can’t just charge our way out of this downturn. But who knows – people the world over can’t seen to get too many dollars. is unintelligible. We presume you’ve read through all that you presented and more . . .
Substantatively, could the Afghan surge have anything to do with getting unemployed young men off the US streets? Chart 2 should be adjusted for population growth. I’ve been tracking these for some time, plus a couple of others at the website given. It has taken longer and longer for employment to recover from recessions, if that pattern holds true for this one we’re in for a long, tough time. Yves accidentally the whole charts! Yves accidentally the whole chart! not sure how one would plot it- but it would be interesting to compare these periods to the debt service burden. My gut feel is that the economy was able to grow despite rising unemployment because those employed were able to increase their spending via increased debt. However if in fact we have peaked in terms of debt service that may not be available this time around. And, productivity is still rising!!!! 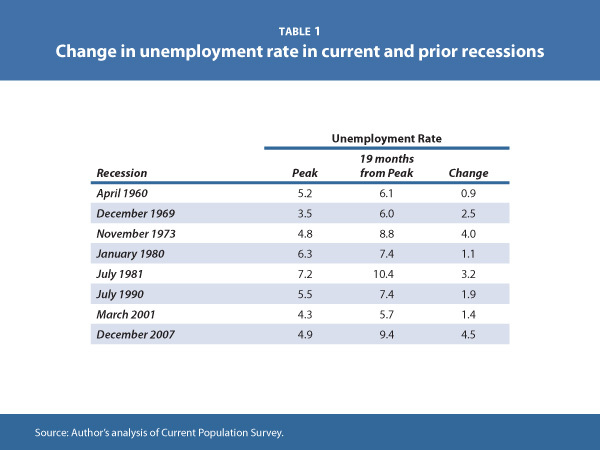 The last number in Table 1 (9.4%) is the U3 unemployment number from the Bureau of Labor Statistics (BLS). It should always be read in conjunction with the broader U6 number which currently stands at over 16%. 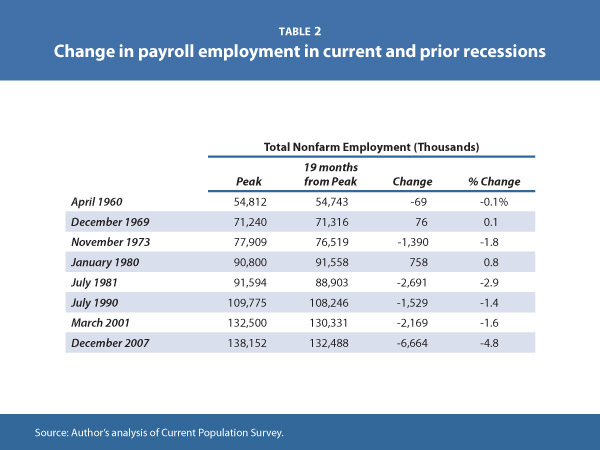 Table 2 also from the BLS indicates that we have lost 6.7 million jobs since the beginning of the recession. This is not the whole story. Job growth in the Bush years before the recession hit in December 2007 was poor. We also need to figure in jobs needed to keep up with population growth (about 120,000/month) . If we figure out to the end of the Obama stimulus (the beginning of 2011), that adds another 4.4 million jobs the economy needs to produce. We also have 5 months left to 2009, including a jobs report that should be out this Friday for August. If we figure conservatively job losses during this period at 200,000/month, this is another million jobs lost. The total so far is 12.1 million. I have said nothing about 2010. I am not sure what the Administration will or will not do. It is an election year. 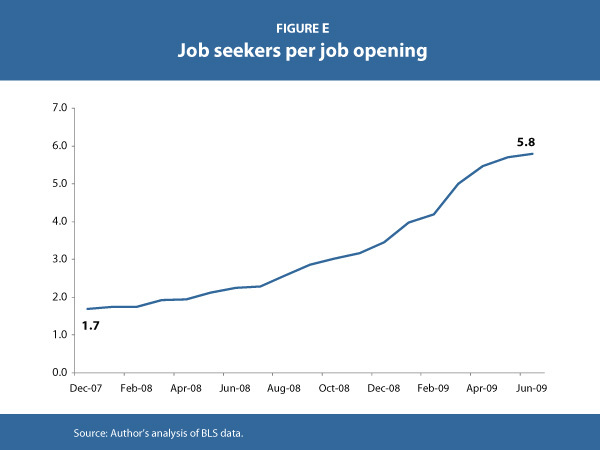 If net jobs are created, the 12.1 million will decrease by that amount. If more jobs are lost, then it will be increased by that much. Like so much else, numbers that reflect the condition of the real economy remain strongly negative. It is only in the fantasy world of the financials pumped up by government bailouts that things look better. The title says it all because there is so much resistance to stepping closer to the employment carnage and “taking a closer look”. I’ve been waging monthly online campaigns to get our local rag to use the weblinks I post on their site to go to the BLS website and 1) read the actual press releases that make the clear distinction between seasonally adjusted numbers which do not tell you exactly how many people are filing jobless claims, and 2) read the ‘actual number’ 3 paragraphs later under the heading ‘unadjusted’. And I push them to 3) read BLS’ U-1 thru U-6 table. But they are frightened journalists who don’t want to be the “only ones” using their own government’s more detailed information. Ditto for their editorial board, though it has a more explicit agenda of ‘cheerleading’ the economy. This recession started when the US was already in the holw with Particpation Rate around 66%and shy 7 tenths of 1% of the percntage immediately after the 2001 recession. It will take more than just keeping up with population growth. Thanks for writing the numbers. I was surprised by the failure to create jobs in the first place. 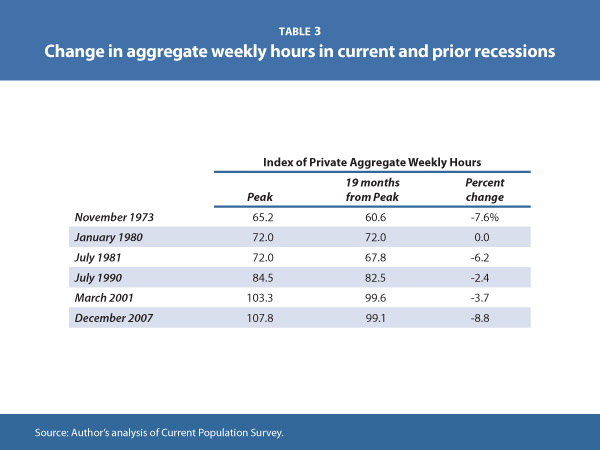 Table 2 shows peak employments at various times. The change in employement, peak to peak, is scary bad. From 1980 to 1990 the gain is about 19 million jobs. From 1990 to 2001 the gain is almost 23 million. But from 2001 to 2007 the gain is only a fraction over 5.5 million. That’s the worst showing ever in absolute terms (in the table). Don’t even think about percentage terms. If the USA couldn’t produce but 65,000 jobs per month (on a very rough average) during a boom period what will happen on a low growth trajectory? This is not a difficult problem: simply reduce the work week. It would be cheaper than paying unemployment, or trying to prop up asset prices. I think this article is headed in the right direction. But I also believe the unemployment picture is far worst than anyone in the FED can imagine. This has been coming since at least the mid 90’s with the exit of major corporations and industries via free trade agreements. The politicians wanted the US to become a service economy. The number of displaced workers that are out of work and uncounted have been accumulating for years. Even before the Economic Crisis ,in 2006, some work seekers speculated the real unemployment rate was 18%. These people where out of the statistics and having an extremely hard time finding a job. This disaster didn’t happen over night. The politicians had to have a pale of water dumped over them to get the message. They still don’t get the full gravity of the unemployment situation or the state of the economy. They want to cherry pick the facts.